I've been thinking a lot lately about how friends emerge in unexpected ways. Someone you've always thought of in one dimension -- a person who was an adult when you were a child, and the opposite -- can suddenly look new and different. A "new" friend -- no longer simply and primarily some kind of category like a teacher, an uncle, a grandparent, or your own child. My Auntie Pat is 92 years old and lives in Maine. My mother's younger sister, she was always my favorite aunt. When I would have one of my temper tantrums, which evidently were frequent, she could always cajole me out of them by singing in her pitch-perfect voice or by reciting poems. She was of a generation and culture that memorized poems, lots of them. They were often elocution exercises, meant to erase the harsh Northern Ireland accent. One of her favorites was this Victorian gem: "A Broken Heart" by R.S. Hichens. She loved saying that last line, with a flourish: "One less thing to dust!" Once, during one of our summer trips from California, I was ill and confined to an upstairs bedroom of my grandmother's house in Northern Ireland. A servant brought up a breakfast tray for me and my six-year-old self deliberately turned it upside down onto the floor. So, there. Auntie Pat was sent up to deal with me. 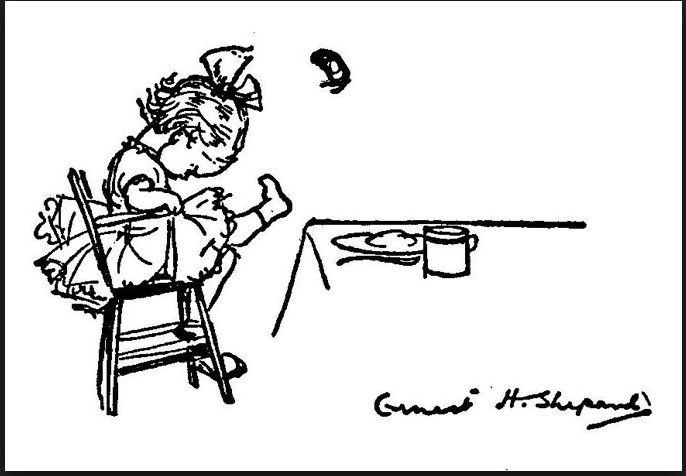 She sat on the bed and with a knowing, tolerant smile began to recite the A.A. Milne poem, "Rice Pudding": "What is the matter with Mary Jane?/She's crying with all her might and main/ And she won't eat her dinner -- rice pudding again." I loved her for that then and always. She was pretty and funny and merry. A child's delight. When I was married with two children and we moved from Virginia to New York, she immediately called and said, "Why don't you come up here to Maine for some R & R?" We did and it was the beginning of many trips north to visit, to ski, to help when her American (and only) husband, Uncle Carl, was dying. When I was getting divorced, she called and said, "I understand you're having a tough time." No judgment, just sympathy. Since then I've gone about twice a year to see her where she lives alone in a house just off the main street of a tiny Maine town. I stay for two nights, no more. I bring in food and we talk about long ago in Northern Ireland. The older she gets the more truthful the memories become. It's like a veil lifting to reveal an alternate universe behind the family myths. She was, like my mother, a war bride. They married Americans working for Lockheed at an airplane plant that was quickly thrown together with the Brits after Pearl Harbor. I am just about the only person on this side of the pond to whom all the names and memories she wants to share make any sense because I lived in Ireland when I went to college in Dublin. But even without all that background, she is simply the best company. She can still find the humor in just about anything. She had to. Uncle Carl's work kept her and their four children moving from town to town, state to state, over and over again. During this last visit she told me that the Maine house was her fifteenth. A couple of months ago I drove up from Virginia to see her. One sunny, clear June afternoon I persuaded her to come out for a very short walk up the road of her cul de sac. She had her cane in one hand and the other was hooked into my right arm. As we proceeded very slowly -- she bent over almost double, her white hair shining in the sun -- she pointed out the trees, the flowers, the beautiful valley that stretches out behind her house. She commented with her sharp wit on the idiosyncracies of the neighbors living in the houses along the way. She quickly tired, hanging, now, on my arm, and we turned back. I suddenly had a premonition that this was the last time we would be together here, in this little piece of Maine. A week later Auntie Pat fell and had to go to the hospital and then into rehab. She can't live alone any more; the house is up for sale. She will go into some kind of assisted living near her son, my cousin, in Portland. I always thought she'd do better in a more social setting, where she could be, would be, the center of attention. I look forward to more visits with this dear auntie who became, with time and age, one of my best friends, now and forever.